Bronchiectasis is a disease in which there is permanent enlargement of parts of the airways of the lung. In this condition damage to the airways causes them to widen and become flabby and scarred. The airways are tubes that carry air in and out of the lungs. Usually the disorder occurs as the result of a preexisting lung disease. Certain inherited disorders such as cystic fibrosis can predispose the lungs to recurrent infections that result in bronchiectasis. 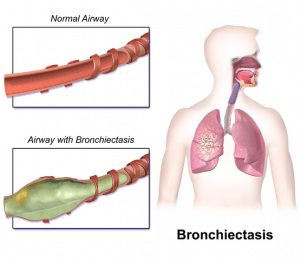 Bronchiectasis is an uncommon disease, most often secondary to an infectious process that results in the abnormal and permanent distortion of one or more of the conducting bronchi or airways. Bronchiectasis is often noted as a secondary phenomenon to a more severe pulmonary pathology, as is the case of asthma or chronic obstructive pulmonary disease (COPD), and as such goes unreported. Conversely, the widespread use of computer tomography (CT) as a diagnostic tool in respiratory medicine has resulted in the identification of an increased number of radiological bronchiectasis cases in patients who showed no symptoms and who would have otherwise not been classified as having it. Bronchiectasis is relatively uncommon in the United States, with a prevalence of approximately 100,000 cases, based on data from the 1990s. That said, the number of bronchiectasis cases in the United States associated with atypical mycobacteria or other environmental factors reportedly has increased, perhaps due to improved detection techniques for atypical mycobacteria. Unsurprisingly, given the often chronic nature of its development, the prevalence of bronchiectasis and hospital admission related to bronchiectasis increased with age. 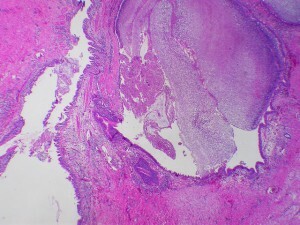 Bronchiectasis may be the sequela of a variety of necrotizing infections that are either inadequately treated or not treated at all. Primary infection (ie, in the absence of intrinsic defects or noninfectious extrinsic insults) was a particularly common cause of bronchiectasis in developed countries prior to the widespread use of antibiotics and it remains important in developing countries, where antibiotics are used inconsistently. Bronchial dilatation can be caused by a structural defect in the wall itself, an effect of abnormal airway pressure on the bronchial wall or by damage to the airway elastic tissue and cartilage as a result of bronchial wall inflammation. Inflammation within the bronchial wall can be the result of an infection within the airway, inhalation of injurious agents or an endogenous condition such as an autoimmune disease. Bronchiectasis has both congenital and acquired causes, with the latter more frequent. Tuberculosis, pneumonia, inhaled foreign bodies, allergic bronchopulmonary aspergillosis and bronchial tumours are the major acquired causes of bronchiectasis. Infective causes associated with bronchiectasis include infections caused by the Staphylococcus, Klebsiella, or Bordetella pertussis, the causative agent of whooping cough. Aspiration of ammonia and other toxic gases, pulmonary aspiration, alcoholism, heroin (drug use), various allergies all appear to be linked to the development of bronchiectasis. Bronchiectasis may result from congenital infections that affect cilia motility or ion transport. A common cause is cystic fibrosis, which affects chloride ion transport, in which a small number of patients develop severe localized bronchiectasis. Other less-common congenital causes include primary immunodeficiencies, due to the weakened or nonexistent immune system response to severe, recurrent infections that commonly affect the lung. Bronchiectasis is a result of chronic inflammation compounded by an inability to clear mucoid secretions. This can be a result of genetic conditions resulting in a failure to clear sputum (primary ciliary dyskinesia), or resulting in more viscous sputum (cystic fibrosis), or the result of chronic or severe infections. Inflammation results in progressive destruction of the normal lung architecture, in particular the elastic fibres of bronchi. Endobronchial tuberculosis commonly leads to bronchiectasis, either from bronchial stenosis or secondary traction from fibrosis. Bronchiectasis is an abnormal dilation of the proximal and medium-sized bronchi (> 2 mm in diameter) caused by weakening or destruction of the muscular and elastic components of the bronchial walls. Affected areas may show a variety of changes, including transmural inflammation, edema, scarring, and ulceration, among other findings. Distal lung parenchyma may also be damaged secondary to persistent microbial infection and frequent postobstructive pneumonia. The tissue is also damaged in part by the host response of neutrophilic proteases, inflammatory cytokines, nitric oxide, and oxygen radicals. This results in damage to the muscular and elastic components of the bronchial wall. Additionally, peribronchial alveolar tissue may be damaged, resulting in diffuse peribronchial fibrosis. The result is abnormal bronchial dilatation with bronchial wall destruction and transmural inflammation. The most important functional finding of altered airway anatomy is severely impaired clearance of secretions from the bronchial tree. Impaired clearance of secretions causes colonization and infection with pathogenic organisms, contributing to the purulent expectoration commonly observed in patients with bronchiectasis. The result is further bronchial damage and a vicious cycle of bronchial damage, bronchial dilation, impaired clearance of secretions, recurrent infection, and more bronchial damage. 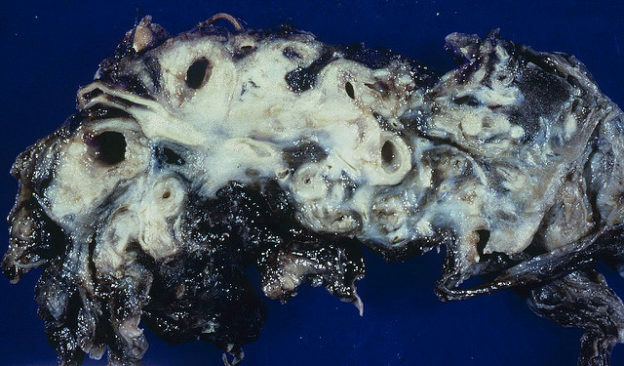 Bronchiectasis can be characterized as cylindrical, cystic, or varicose in nature. Cylindrical bronchiectasis involves diffuse mucosal edema, with resultant bronchi that are dilated but have straight, regular outlines that end squarely and abruptly. Cystic or saccular bronchiectasis has ulceration with bronchial neovascularization. The result is a ballooned appearance and sometimes air-fluid levels. Varicose bronchiectasis has a bulbous appearance with a dilated bronchus and interspersed sites of relative constriction and, potentially, obstructive scarring. The latter may subsequently result in postobstructive pneumonitis and additional parenchymal damage. The classic clinical manifestations of bronchiectasis are cough and daily mucopurulent sputum production, often lasting months to years. Blood-streaked sputum or hemoptysis may result from airway damage associated with acute infection. Less specific symptoms include dyspnea, pleuritic chest pain, wheezing, fever, weakness, and weight loss. A rare variant known as dry bronchiectasis manifests as episodic hemoptysis with little-to-no sputum production. Dry bronchiectasis is usually a sequela of tuberculosis and is found in the upper lobes. Exacerbations of bronchiectasis that are caused by acute bacterial infections are often heralded by the onset of increased sputum production over baseline, increased viscidity of sputum, and, occasionally, a foul odor of the sputum. Rarely, low-grade fever may also occur. Patients may experience an increase in generalized constitutional symptoms, such as fatigue and malaise, as well as increased dyspnea, shortness of breath, wheezing, or pleuritic pain. Chronic productive cough is prominent, occurring in up to 98 % of patients. Sputum is typically produced on a daily basis in greater than 70 % of patients. Some patients produce sputum only with acute upper respiratory tract infections, otherwise, they have quiescent disease. Sputum is typically mucoid and relatively odorless. During infectious exacerbations, however, sputum becomes purulent and may develop an offensive odor. Hemoptysis occurs in majority of patients with bronchiectasis. This is often the factor that leads patients to consult a physician. Bleeding usually originates from dilated bronchial arteries, which contain blood at systemic (rather than pulmonary) pressures. Wheezing is commonly reported and may be due to airflow obstruction following destruction of the bronchial tree. Fatigue is also commonly reported. Weight loss however, often occurs in patients with severe bronchiectasis. Auscultation findings include wheezing and humming as well as rhonchi. Nasal polyps and signs of chronic sinusitis may also be present. Patients often present with a long history of chronic cough accompanied by green/yellow blood-streaked sputum. Patients report repetitive pulmonary infections that require antibiotics over several years. Sub-febrile Temperatures or Fever may be present. Hemoptysis which is more commonly observed in dry bronchiectasis is generally mild and manifested by blood flecks in the patient’s usual purulent sputum. Many patients relate a history of childhood infections that may include tuberculosis, pertussis, or Mycoplasma infection. Bronchiectasis is a morphologic diagnosis and so it may exist with relatively few indicators. A high-resolution CT (HRCT) scanning is the criterion standard for the diagnosis of bronchiectasis. The main advantages of HRCT scanning include non-invasiveness, avoidance of possible allergic reactions to contrast media, and information regarding other pulmonary processes. A chest computed tomography scan, or chest CT scan, is another common test for diagnosing bronchiectasis. Posterior-anterior and lateral chest radiographs should be obtained in all patients. Expected general findings include increased pulmonary markings, honeycombing, atelectasis, and pleural changes. Blood tests. These tests can show whether there is an underlying condition that can lead to bronchiectasis. Blood tests also can show whether there is an infection or low levels of certain infection-fighting blood cells. The choice of laboratory tests may vary and should be tailored to the individual patient and clinical situation. If bronchiectasis doesn’t respond to treatment, bronchoscopy may be recommended. Bronchoscopy can show whether there is a blockage in the airways. The procedure also can show the source of any bleeding in the airways. 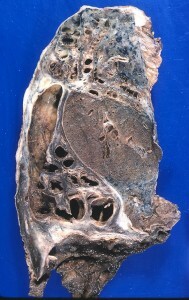 Chest CT may be normal or show emphysema in COPD, as opposed to the characteristic abnormal results found in bronchiectasis (thickened, dilated airways with or without air fluid levels, varicose constrictions along airways, ballooned cysts at the end of a bronchus, and/or tree-in-bud pattern). Diminished breath sounds, characterising COPD, are not found in bronchiectasis. In bronchiectasis, rhonchi may be auscultated, but with additional inspiratory squeaks and crackles. Inspiratory squeaks and crackles, often present in bronchiectasis, are not present in asthma. Chest CT may show thickened airways but lack the enlarged or widened airway (signet ring sign) seen in bronchiectasis. Patients with pneumonia describe symptoms of short duration (7 to 10 days), as opposed to years in bronchiectasis. Auscultation findings (rhonchi, wheezing, crackles) may be similar in bronchiectasis and pneumonia, especially multi-lobar pneumonia. Bronchial breath sounds, which are characteristic of pneumonia, are not present in bronchiectasis. Consolidation, which is seen in pneumonia, is not seen in bronchiectasis. The inspiratory squeaks and crackles found in bronchiectasis are uncommon in chronic sinusitis. CXR and chest CT are normal in chronic sinusitis. Sinus CT shows opacification of the involved facial sinus in chronic sinusitis. The goals of therapy are to improve symptoms, to reduce complications, to control exacerbations, and to reduce morbidity and mortality. Management of underlying conditions, which may include the use of intravenous immunoglobulin or intravenous alpha1-antitrypsin (AAT) therapy, is essential to the overall treatment. Antibiotics and chest physiotherapy are the mainstay modalities. Other modalities may include bronchodilators, corticosteroid therapy, dietary supplementation, and oxygen or surgical therapies. Admitting patients with severe exacerbations of bronchiectasis to the hospital and treating them with intravenous antibiotics, bronchodilators, aggressive physiotherapy, and supplemental nutrition is not uncommon. Pharmacologic therapy focuses on the treatment of infectious exacerbations that these patients commonly experience, most often in the form of an acute bronchitis-type syndrome. Antibiotics are the mainstays of treatment of patients with bronchiectasis and infectious exacerbations. Oral antibiotics often are used to treat these infections. Bronchodilators, including beta-agonists and anticholinergics, may help some patients with bronchiectasis. This presumably reverses bronchospasm associated with airway hyperreactivity and improving mucociliary clearance. Chest physical therapy also known as CPT or chest clapping or percussion, is generally performed by a respiratory therapist but can be done by a trained member of the family. 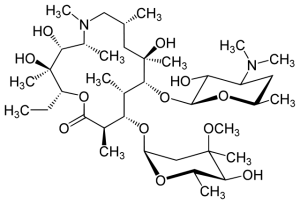 Azithromycin has known anti-inflammatory properties and long-term use has been studied in patients with both CF and non-CF bronchiectasis. In non-CF patients, azithromycin has been shown to decrease exacerbations and improve spirometry and microbiologic profiles. In CF patients a meta-analysis suggests that it improves lung function, especially in those patients colonized with Pseudomonas. Surgery is an important adjunct to therapy in some patients with advanced or complicated disease, but should be reserved for patients who have focal disease that is poorly controlled by antibiotics. Single- or double-lung transplantation has been used as treatment of severe bronchiectasis, predominantly when related to CF. In general; patients with CF and bronchiectasis should be considered for lung transplantation only when FEV1 falls below 30 % of the predicted value. Female patients and younger patients may need to be considered sooner. With aggressive antibiotic therapy, the prognosis is much better. There continues to be a significant reduction in life expectancy in patients with bronchiectasis. 10 % of adults with non-CF bronchiectasis die within 5-8 years of diagnosis, with the cause of death being respiratory in over half of those. Hypoxaemia, hypercapnia, degree of dyspnoea, and radiological extent of disease are closely correlated with mortality. Chronic colonisation by P. aeruginosa, severe exacerbations, and systemic inflammation (raised C-reactive protein) are associated with disease progression in non-cystic fibrosis bronchiectasis. 3.Luce JM. 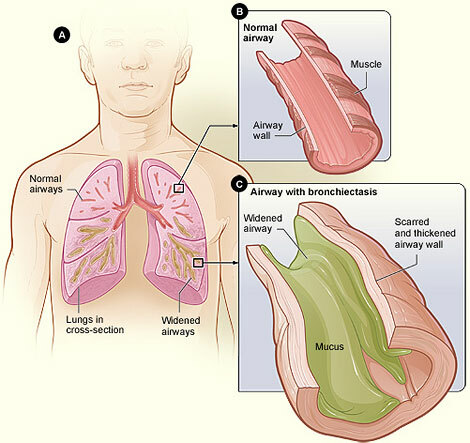 Bronchiectasis. Murray JF, Nadel JA, eds. Textbook of Respiratory Medicine. 2nd ed. Philadelphia, Pa: WB Saunders and Co; 1994. 5.William E.; Helms, Clyde A. (2006). Fundamentals of diagnostic radiology (3rd ed.). Philadelphia: Lippincott, Williams & Wilkins.